Daniel Craig returns as James Bond in this thrilling, action-packed adventure which starts shortly after Casino Royale ends. 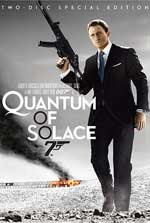 Betrayed by the woman he loved, 007 fights the urge to make his latest mission personal. On a nonstop quest for justice that crisscrosses the globe, Bond meets the beautiful but feisty Camille (Olga Kurylenko), who leads him to Dominic Greene (Mathieu Amalric), a ruthless businessman and major force within the mysterious "Quantum " organization. When Bond uncovers a conspiracy to take control of one of the world 's most important natural resources, he must navigate a minefield of treachery, deception and murder to neutralize "Quantum" before it 's too late!